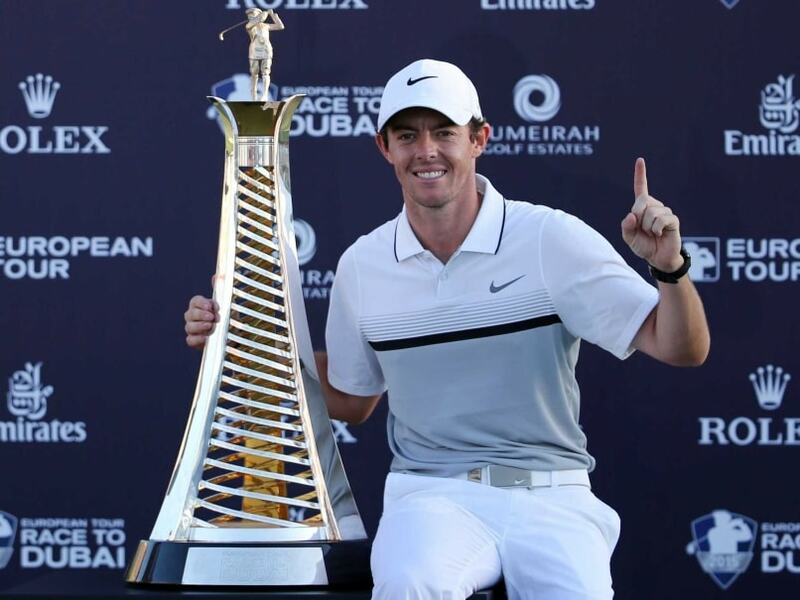 Rory McIlroy put the finishing touches on his 2015 campaign when he won the DP World Tour Championship on Sunday and also retained his Race to Dubai crown for a bumper payday of some $3.208 million (3.02m euros). After another stellar season, Rory McIlroy says one of his priorities for 2016 is to win the Masters at Augusta which would complete the Northern Irishman's Grand Slam set of winning all four majors. The 26-year-old put the finishing touches on his 2015 campaign when he won the DP World Tour Championship on Sunday and also retained his Race to Dubai crown for a bumper payday of some $3.208 million (3.02m euros). It was a season, in which the four-time major winner failed to defend both his British Open and PGA Championship crowns, the former after damaging ankle ligaments playing football with friends. But it ultimately finished on a high as he came back to overhaul Englishman Andy Sullivan by one shot in Sunday's dramatic final round in Dubai. He will now try to emulate Gene Sarazen, Ben Hogan, Jack Nicklaus, Gary Player and Tiger Woods as the only players to win the Masters, US Open, British Open and PGA Championship when Augusta hosts the golfing world from April 7-10. "I think every time you go to Augusta, there's a lot of hype. There was a lot of hype around myself this year and Tiger (Woods) making a bit of a comeback," McIlroy said after his Dubai success. "Next year, the narrative might be around three guys. Myself going for the Grand Slam again. It's always going to be there until I get to put a green jacket on my back. It's obviously the first real goal of the year to try and get ready for the Masters and be in as good a shape as possible going in there. "I felt like I dealt with everything really well this year. I played well and competed well. Some years 12 to 14-under, that could have been good enough to win, but Jordan (Spieth) obviously just played much better than anyone else that week. With the 2015 season successfully wrapped up, McIlroy says he is looking forward to a rest and then getting into top condition for the new season. "I want to try and get healthy and get stronger again, get my body back, because I haven't beeen able to do as much in the gym as I would have liked over the past few months, so really concentrate on that. "I've got an eight week period where I don't have to play golf. I don't have to worry about being sore, going and playing a round of golf. So I really want to concentrate on that. "I put a new driver and a new ball in the bag a few weeks ago, I think Turkey was the first place and I'm really happy with that. I don't really want to tinker much with my equipment going forward. I'm really happy with what I have. The former world number one, who trails Spieth and Australian Jason Day in the rankings, will now recharge his batteries after finishing his season in style. "I'm happy that this was my last event of the year and I've done really well and ended the season on a high and happy to put the clubs away for a while." he added.